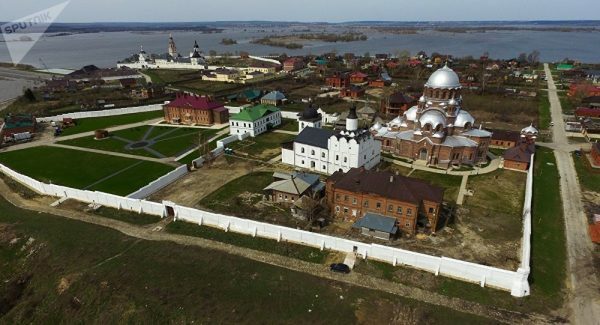 MOSCOW (Sputnik) — The Uspensky monastery and its cathedral in the town-island of Sviyazhsk located in Russia's Republic of Tatarstan was inscribed on Sunday as a UNESCO World Heritage Site, the UN cultural organization said. “Just inscribed as @UNESCO #WorldHeritage Site: Assumption Cathedral and Monastery of the town-island of Sviyazhsk, Russian Federation,” UNESCO said on its Twitter page. Sviyazhsk was founded in 1551 as a Russian fortress used by Tsar Ivan the Terrible for the siege of the town of Kazan. Sviyazhsk was initially located on a peninsula, which turned into an island following the construction of the Kuybyshev Reservoir in 1950s. The Uspensky monastery was founded in 1555. The monastery was one of the most significant Orthodox centers used for spreading Christianity to the Volga and Ural regions.